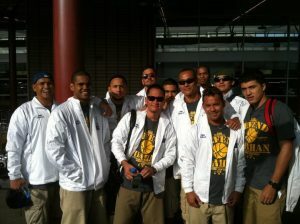 Team Guam landed safely in Noumea, New Caledonia. Their shirt stating what their goal in the 2011 Pacific Games. Although, winning the Gold in the Micronesian Games was satisfactory, Team Guam will have a challenging time bringing home the GOLD.